November is TMJ awareness month, and we wanted to take the time to let our patients know about the importance of noticing the symptoms of TMJ so that they can get treated. TMJ/TMD, also known Temporomandibular Joint Disorder, is a serious condition that can worsen quickly if you don’t treat it. Oftentimes the solution you need for the pain and soreness of that joint lies with your dentist. Let’s take a closer look. The temporomandibular joint is the hinge joint that connects the jawbone to the temporal bone of the skull. This joint, along with the muscles surrounding it, are what give us the motions we need to chew, speak, yawn, etc. As you can imagine, if this joint becomes damaged or misaligned it can lead to pain, soreness, and hardship. That’s where TMJ/TMD got it’s name, and is why we strive to help patients fix the problems before they worsen. What Happens If You Don’t Treat TMJ/TMD? Headaches and Ear Pain: Given the close proximity of the joint and muscles to the ear, some patients experience debilitating headaches and pains around their ear. In some cases, this has even prevented patients from hearing clearly, or being able to concentrate at work, school, or home. Neck or Back Pain: With TMJ, the joint and surrounding muscles may tense up as they overcompensate for the change in jaw pressure. As a result, it’s not unusual for patients to experience pain and soreness in their neck or back muscles as well. Lockjaw: Lockjaw is a very serious state, meaning that you cannot open or close your mouth at all, or it’s painful and difficult to do the movements. If there is a case where your jaw becomes permanently locked in place, it may require emergency care to move your jaw apart. Limited Jaw Movements: With untreated TMJ, patients can expect that it’ll become more and more difficult to perform simple functions like eating, speaking, or yawning. The Beshar Deprogrammer is the name for a customized oral appliance that helps in identifying and diagnosing TMJ, and provides some immediate relief for patients who are suffering. The Deprogrammer starts off as a malleable plastic that is then molded to the person’s bite to diagnose the extent of the problem. The results of the deprogrammer then assist Dr. Beshar and our team into guiding the patient towards the proper treatment. Whether it be through surgery, dental appliances, or physical therapy, the Beshar Deprogrammer can dramatically reduce the time it takes to uncover the source of a patient’s TMJ and set them on the path to treatment sooner. Many of our patients have successfully overcome their TMJ disorder as a result of the findings from this device, and we want to continue that success with you. 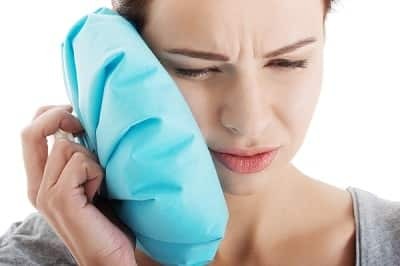 What Are Other TMJ Treatments? Once the issues with your temporomandibular joint have been identified, the extent of your problem will most likely determine which treatment will be chosen for you. At-Home Remedies: If symptoms are light, pain and soreness can be alleviated through eating soft food, using ice packs, and taking pain medication. If symptoms persist, please contact us again for further evaluation. Splints and Dental Devices: Splints or bite guards are plastic appliances that are fitted over the upper or lower teeth for stabilization. Patients would typically wear these at night while they sleep. Botox: Botox is a drug that is injected under the skin, and has been used for certain TMJ cases to relax the muscles around the joint. However, more research is still being done as to the effectiveness or long-term effects of Botox. Dental Implants: In cases where the patient is missing teeth, the change to their bite pattern could be the cause of their discomfort. By placing dental implants in places where teeth are missing, Dr. Beshar can restore your smile and potentially relieve the symptoms of TMJ/TMD. Surgery: In extreme cases, surgical intervention may be needed to correct the jaw joint or restore tissues in or around the joint itself. This may require specialists and hospitalization. If you’re asking yourself this question, the next step should be to pick up the phone and give Dr. Beshar a call. Sometimes, even the lightest of symptoms can spell trouble for things to come. If you’re worried about your oral health, the best course of action is to contact us for a personal consultation with Dr. Beshar. As the innovator behind the Beshar Deprogrammer, Dr. Beshar has the experience and skills to accurately assess your TMJ/TMD issues and uncover the best treatment for your situation. He was even published in Volume 36 of the “Compendium of Continuing Education in Dentistry” for a successful case where he used the device to diagnose and treat a patient’s unhealthy smile. As a premier cosmetic and restorative dentist in Manhattan, Dr. Beshar has proven time and again to be an innovator in dental care. Thanks to his invention of the Beshar Deprogrammer, patients like you who are suffering from TMJ can get the relief you need. Contact us today to learn more about scheduling a consultation and qualifying for TMJ Treatment.